Omega's Speedmaster Professional has the honor of carrying the most unique award a watch has ever received: NASA's Silver Snoopy award. Two different models of this timepiece pay homage to the rescue of the Apollo 13 mission. The Moonwatch needed only 14 seconds to make its mark on history. That's how long it took astronauts to right the course of their damaged Apollo 13 spacecraft back toward Earth in the spring of 1970. 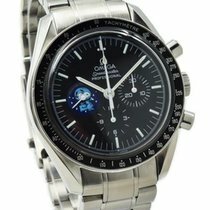 The astronauts timed the vital 14 seconds using a Speedmaster Professional, NASA's official watch. The lives of the three men on board depended on the watch working perfectly. Otherwise, they would have missed Earth by thousands of miles and been lost in space. However, the mission came to a happy ending on April 17th, 1970. The crew made it back to Earth, landing safely in the Pacific Ocean. 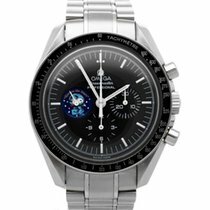 NASA thanked Omega for the Speedmaster Professional's outstanding performance by awarding it with the Silver Snoopy award, NASA's highest honor. It's usually awarded to NASA employees for outstanding achievements or contributions relating to flight safety or missions. The prize is a sterling silver lapel pin showing Snoopy as an astronaut. Snoopy is NASA's mascot, and Peanuts creator Charles M. Schulz personally designed the prize. 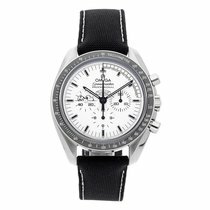 Omega created two special edition models of the Speedmaster Professional to honor the dramatic events of April 1970. The newer Snoopy model is the more striking of the two. 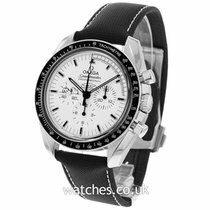 Omega introduced it at Baselworld 2015, 45 years after the Apollo 13 mission. You immediately notice this watch's white dial, in contrast to the other Speedmaster Professionals, which have dark dials. The white watch has a few extras, too, such as a sleeping Snoopy on the small seconds subdial. While not obvious during the daytime, the little beagle is luminous and glows in the dark. The 2015 Silver Snoopy Award saves the main attraction for its case back, however. A sterling silver medallion with Snoopy as an astronaut adorns the case back, a reproduction of the actual award. The medallion is set against a blue enamel background, making it look as if he's flying through space. Each watch is unique, as the silver powder used to make Snoopy is applied by hand. The total number of watches is limited to a run of 1,970, a reference to the year of the Apollo 13 mission. What's more, prices for the white Omega Snoopy edition have been on the rise. When Omega introduced the new 2015 version of their special edition Silver Snoopy award watch, it cost 7,350 USD. Only one year later, the price for a new, never-worn watch had already risen to over 11,700 USD. Today, the same timepiece costs around 23,400 USD. The manufacturer chose white as the dominant color for this watch in order to replicate the Peanuts look, as the comics often appear in black and white. The first 14 seconds on the dial each have a frame resembling a comic strip panel with the inscription "What could you do in 14 seconds?" beneath them, a reference to those critical seconds on board Apollo 13. A quote from former NASA flight director Gene Kranz is above the axis of the hands: "Failure is not an option." How much does an Omega Snoopy Award from 2003 cost? Omega had already released a timepiece bearing the image of the beloved canine 12 years before the 2015 special edition Silver Snoopy Award. The 2003 Snoopy more closely resembles the standard Moonwatch due to its black dial. On the front, Snoopy is wearing a spacesuit and has taken up residence on the small seconds dial. The Snoopy Award motif is composed of two shades of blue, as well as red and white. The case back features the same imagery but in a larger format. Its colorful design makes this 2003 Speedmaster "Snoopy" a visual treat. This timepiece is coveted by collectors; plan on spending about 12,900 USD on a well-maintained example. This version had a limited run of 5,441 pieces. The Snoopy variants share many significant details with the normal Omega Speedmaster Professional. The stainless steel cases of the watches are all 42 mm, and the manual caliber 1861, with a 48-hour power reserve, keeps the watches ticking. The movement has remained almost unchanged since the late 1960s and is based on a caliber from Lemania. 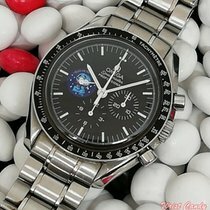 The Speedmaster Professional is not only known for its use on the Apollo 13 mission, but also for accompanying the first astronauts to land on the Moon on July 20, 1969. Beforehand, NASA had tested many mechanical watches from different brands. The Speedmaster performed the best, withstanding extreme temperatures, vibrations, increases in velocity, and other strenuous conditions. The original Moonwatch used Hesalite (plexiglass) since it doesn't splinter. On the other hand, the Snoopy models use scratch-resistant sapphire glass.Originally, Omega designed the Speedmaster to determine speeds during car races. In this way, it's comparable to the Rolex Daytona. These watches are two of the most renowned chronographs in the world.